Lake County just got a new sandwich place that is super delicious. The menu above should say it all. 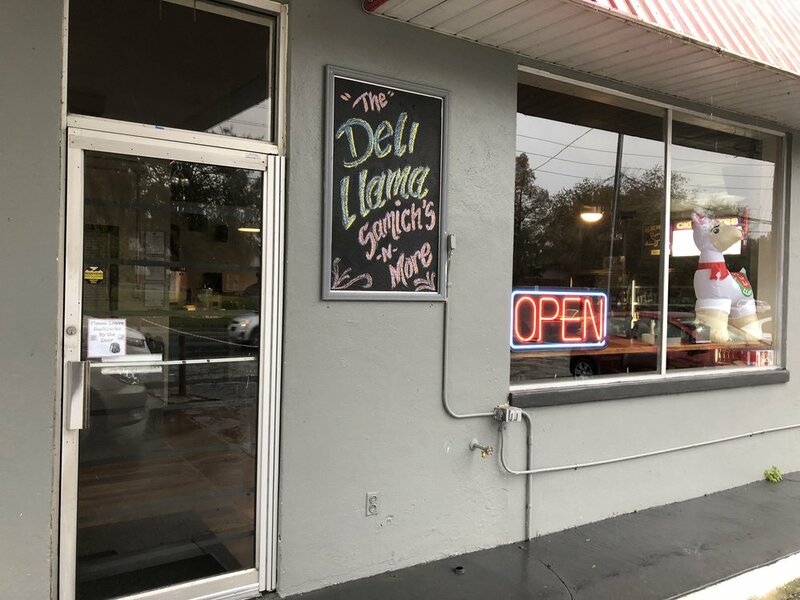 The Deli Llama. Tons of gluten free, carnivorous, and vegetarian options. Take a trip up to Tavares from Orlando. It’s just around the lake from Mount Dora. Lake Dora, that is. On old 441 about ten minutes from Downtown Mount Dora. Downtown Tavares is cute, walkable, and has those lakeside breezes. The Deli Llama in an old gas station, but the decor makes the place feel like home the second you walk in. They are going to start serving coffee in January so watch out coffee lovers…you may have a new destination on your hands. This is the Hot Mess sandwich. I got it to go so the photo presentation isn’t perfect. The taste however, was. Hot capicola, house-made turkey, house-made pimiento cheese, dressed arugula, and cherry peppers. It’s got some heat to it.